The holidays (or perhaps more accurately, holiday films) are a time for heartwarming depictions of helpful angels: Clarence, the Angel Second Class of It’s a Wonderful Life and Cary Grant’s debonair Dudley of The Bishop’s Wife spring to mind. Generally the literature of the 19th century puts angels firmly in guardian angel roles, guiding the lost, keeping children from straying over a precipice, or, as in this first story, hovering over a sickbed with healing in its wings. Shadow on Wall Regarded as Good Omen. Wilmington, Del., April. 14. Mr. and Mrs. William Robinson, of Eight and Buttonwood streets, have stirred their neighbors by the startling announcement that while their daughter lay at the point of death, and at the turning point of a critical illness, the shadow of an angel appeared on the wall above the head of the sick girl’s bed and remained there until daybreak, after which time the girl began recovering rapidly. Mrs. Robinson, the stepmother of the girl, in speaking of the shadow, said it seemed to possess the form of the young girl, while it had the face of the mother. It remained there motionless with outstretched wings. Mr. and Mrs. Robinson stood over the bed for some minutes watching the shadow and the form of the girl. She lay as motionless as she had lain throughout the latter part of the night. A few minutes before dawn came a flood of light over the bed, the girl stirred and her breathing became more pronounced, and before the light of day flooded the room, the shadow had disappeared and the girl had regained consciousness, and the physician arrived in time to calm the mother and father before they told of the incident. AN EXTRAORDINARY EVENT OF MY LIFE. As in so many accounts of the paranormal, the memorandum made at the time is less explicit than the explanation given by the Rev. Asbury. Our final story shows the angels in the role of psychopomp, coming to bear away the soul of the dying woman. Even though they were angels (and 19th-century angels were usually gentle, sentimental, gauzy creatures) they were enough to frighten the young witness and make her sceptical father uneasy. THE following incident, which was mentioned to me in September last, occurred to Mrs. Nolan-Slaney’s sister, a healthy, bonny girl of eighteen. “I gave her description,” Miss Slaney writes, “exactly as she wrote it a few days after the death of our neighbour, and I may add that, although she has told the story many times in my hearing, it has never varied from the original version. “The neighbour mentioned was a charitable, honest, God-fearing woman, plain-spoken and practical, and an invaluable nurse. She was taken ill with influenza, in February, 1895, and had been ailing since, but my sister did not know that she had been taken worse, and played and sung with my brother the evening before, as usual, in a room almost beneath the one in which the sick woman lay—which, of course, they would not have done had they had the faintest idea that she was worse than usual. “I append to my sister’s description of her ‘vision’ the questions I put to her when she first told me of it, and have asked her to sign the whole. “‘My back was towards the corner where Tom’s” box stood, but my sister faced it. She said, “If you look towards that corner you’ll see three rays(?) like half-moons, coming up from behind Tom’s box. They are shaped like half-moons, but shine like the sun.” I looked but I could not see anything. They disappeared as my mother passed away. “Lord Jesus!” she said several times, then she sat upright in bed and stretched out her arms, saying, “Clara, Tom,” and fell back and died. “These two statements, in many respects so singular, have been duly signed in my presence, and, if necessary, the evidence of others could easily be produced. I know all the parties concerned, and can testify, not only to their veracity, but to their level-headedness. For me the question is, why did the angels, if angels they were, apparently blunder into the young girl’s room instead of going directly to the dying woman’s bedside? 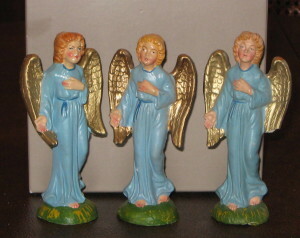 The description suggests the Old Testament cherubim and seraphim, rather than the standard lithographed Victorian Christmas angel. Any other stories of helpful angels? Wing them to Chriswoodyard8 AT gmail.com.